Hello everyone, welcome. Today I am going to be talking about a scheduled roleplay game that I booked onto whilst attending the UK Games Expo 2018, in this case Wraith: The Oblivion. 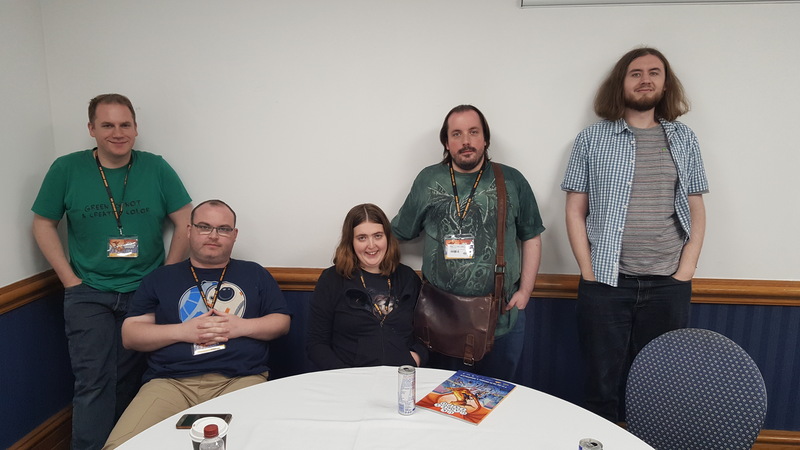 Something that I learned last year whilst attending, but was not able to participate in due to my time volunteering, was that one of the attractions at the UKGE is scheduled roleplay games run by experienced and potentially famous games masters. (As famous as a games master can be). Knowing that I would have time this year I searched the game listings for World of Darkness games, hoping to find Vampire: The Masquerade/The Dark Ages as I love that game, or Mage: The Ascension as I would love to play that game but the rules boggle my mind. None of those games were on offer but there was a single World of Darkness in the listings. Wraith: The Oblivion. So, I was happy. A game I had never played run by a GM who seems to know his stuff. So, I pitched up at 9am on the first day of expo for the game. Not an ideal time for gamers, it has to be said but I managed and so did 4 of the other 5 players (it was a six player game and one didn’t attend). As it was a public expo game, characters were pre generated and given at the start, with rules being stripped down to the bare minimum required to provide structure and fun. As someone with familiarity with World of Darkness games, if not Wraith, and someone who had been pestering Matthew by email for a week before hand I was taken aside to be given a character first. After deciding that I didn’t mind what I would be playing I was given a special character. I was told the story happened in Denton, Maine, and there was slasher on the loose in this sleepy 1980s fictional woodland town. I would be playing a little old Japanese woman name Ko Meeda, and she would know something about the slasher. And it would be my job to introduce that plot to the game. It could be anything I wanted as nothing I could come up with would break the game. I was also dead. But, unlike the other players starting the game dead, I was playing a Risen (a zombie) instead of a Wraith. I envisioned myself walking around a bit like Madame Gao in Daredevil. However I also had super strength, toughness and speed. None of which the other players would know. I decided that the thing I knew was that my character had a Daughter, Iko, who was the first reported victim of the Slasher and that she died in Ko’s arms telling her a clue. And that after that, Ko committed ritual suicide. Though she doesn’t remember the suicide, only that she died a long time ago. From left to right we have Matthew, the GM, John (Who played Helen DaSilva), Jess (Who played Elinore), Gary (Who played Mel, Elinore’s boyfriend), and Sam (who played Pete Carlton, Helen’s Step-Son). The game started in the 1980s, in Helen DaSilva’s kitchen. Pete was upstairs listening to Duran Duran at high volume when a huge arm shrouded in darkness snaked through the kitchen window and began trying to murder Helen. Helen put up a valiant fight with a whisk, and the aid of a frying pan toting Pete, and was able to drive away the slasher. We then skipped over to Elinore and Mel who found themselves wandering around the Wraith version of Denton. They were dead. They remembered Prom Night, they remembered slipping away to the retreat of choice for coupling teens in Denton which we decided was the Saw Mill (I will admit much of our game was for comedic effect and the Saw Mill is really not a good place for such encounters. As demonstrated by Elinore and Mel, who both died there having had a saw blade thrust through Mel’s back and Elinore’s front seconds later.) After realising they were dead and drifting round town for a time they appeared outside the DaSilva house hearing the screams of a defiant Helen DaSilva, yelling for Pete to run away. The two newly dead wraiths lurked outside the house, whilst Pete and Helen tried to make sense of that had happened. And then there was an ominous knocking at their front door. Pete Answerred the door whilst Helen called the Sheriff station (only to be cut off just a second after she said horrible murderer). Pete opened the door to find Mrs Ko Meeda, played by me, the reclusive old Japanese Woman. For comedy value, John playing Helen Dasilva decided at this point Helen always got my name wrong, calling me Mrs Ko instead of Mrs Meeda. As I was a zombie with a one track mind (Find daughter’s killer. Kill it. Die. Technically a three track mind) I decided Mrs Meeda was blunt to the point of irritation. I started spouting stuff about “It’s been here…You survived…Did you see it?” all the while Helen Dasilva talked loudly at me, calling me Mrs Ko and generally treating me as if I was a mad woman. This was quite funny. Then, Mel spotted a shadow looming behind me and surged forward. I could see him and Elinore, and as soon as I saw him surging at me I sidestepped ludicrously quickly. For some reason he had a circular saw stuck to his hand, which he used to good effect to slaughter what turned out be Deputy Jessop who was behind me. He died horribly, though Ko was nonplussed as she recalled he didn’t investigate Iko’s death very thoroughly, nor did he believe me about Iko’s last words (more on that later). And then whilst we all were evacuating to the basement to try and figure out what was going on, we saw a second version of Deputy Jessop (or the wraiths and I saw) that looked like a photo negative superimposed over his body. Me the player knew enough to know this was probably a spectre, a wraith driven by rage and hatred only. Fortunately for me, I was hiding in the basement with everyone else whilst Wraith Mel discovered he had an ability called Keening, which was basically a banshee scream. Having remained upstairs to try and console the wraith of Jesssop, Mel was ideally placed to defend himself when Spectre Jessop appeared. Mel’s scream did a fair chunk of damage to the Spectre but didn’t destroy it. That was when the amorphous dark shadowy form of the slasher reappeared and slaughtered the spectre. Mrse Meeda felt this horrible presence and ran upstairs letting out an unintelligible cry, hoping to avenge Iko, Helen DaSilva trying to stop her by jumping on her back. Helen DaSilva did not anticipate exactly how strong Ko was (strong enough to charge upstairs with a full grown woman on her back and still beat a monstrous creature with a walking stick). Ko was joined by a baseball bat wielding Pete and Elinore, who was able to rebuke the creature by telling it her father was a policeman and it had better leave now! This rebuke, which shouldn’t have worked, worked and along with the beating the rest of us were laying on the creature we drove it off (nearly killing Matthew’s plot 1 hour into the game). We then moved to an exposition scene where I started talking to the living and the wraiths interchangeably, leading to people assuming I was a medium (and jokes about me being a small…). By the end of the scene, Helen and Pete were aware of the Wraiths even if they chose not to believe me, and I had dropped my big bit of plot. This led us to believe that faith and holy stuff might work so we found the local holy man, Reverend Brooks. By this point, there was only Pete and Ko walking the land of the living, though Elinore discovered she had the ability to manifest and chose to appear as well. Ko bluntly informed Reverend Brooks what was happening, which naturally he didn’t believe until he went on his own to make a pot of tea, and was attacked by the Slasher. We drove the thing off again with a combination of beating and rebuking, though not before it taunted us “Death makes me stronger!” There then followed an amazingly funny scene where Reverend Brooks faith was challenged when he realised I was a zombie and Elinore disappeared then manifested again as a ghost. We convinced him that an exorcism was needed, but as it turns out he wasn’t trained in that. However he suggested a prayer circle and I offered to be the bait. The idea being that the creature only ever attacked when someone was alone. So I ventured alone into the graveyard and found myself next to the very old gravestone of Iko (I didn’t notice how old it was at this point…) Ko heard Iko’s voice pleading for comfort. She had been alone for so long, she just wanted her mother to embrace her. Of course, when Ko looked at Iko, she looked like a blobby amorphous mass of writhing darkness and I realised it wasn’t Iko. Of course, vengeance doesn’t necessarily have common sense, so instead of yelling for help and running, I belted it with my stick and ran. Unfortunately, its arm grew in length and dragged me back to the distended maw that was its mouth. It never moved from the spot, the arm simply elongated as the mouth did also. Ko let out a scream at this point. The other characters rushed out to find Ko half swallowed by the creature, holding its mouth open with all of her remaining strength. I am not sure if that would work in a standard game of Wraith but it worked in this game. The creature, a Neverborn, let out a mournful cry and then said “Thankyou” just before it and Mel vanished. This caused a temporary respite, until Ko realised there was business still unfinished. I realised that the tombstone was older than I expected and then tried to recall when I was alive. I could not. Then, through a convoluted series of questions to Matthew I determined that Ko does not have a heartbeat as a zombie but she did when she was alive, so she could meditate and remember when her heart beat last. One meditation roll later and it transpires Ko has been a zombie for 70 years, and that Iko died 50 before that. I then recalled that Jessop, the deputy, hadn’t believed me about the place with the animals, which meant Jessop had been around for a long time. We decided to check the police station to see if they had any hunting photos on the walls. We distracted the deputy on duty whilst Elinore and Helen did some Wraith surveillance. (Yup, post dismembering, Helen became a wraith) They found a number of photos of the Sheriffs at a shooting range in the woods. A few unlikely bluff checks later, we had convinced the deputy on duty that was where we needed to get Pete for safety (perhaps unrealistic in a standard game, but we were running low on time and I think Matthew was happy to get us moving forward). We got to the shooting range/hunting lodge and managed to get in with the Key that Wraith Helen had managed to steal from the deputy with her newfound telekinesis. Inside we found about 60 jars with captive wraith souls. Ko was vaguely aware that they were used as currency in the underworld, and that breaking the jars would at least give the wraiths a choice. Helen used massive Telekinesis to smash them all in one go which created a huge maelstrom of glass and wraiths. About half the wraiths, driven mad in their captivity, attacked, whilst the other half recognised we were helping and defended us. The maelstrom subsided quickly, with Pete running outside protected by Helen and a small squadron of wraiths. Ko remained as two wraiths seemed interested in her. They were Iko, and her still unnamed husband. They asked if I was coming with them, and as I had been ready to die in the mouth of the Neverborn and was robbed of that death I was more than ready to go now. Ko instinctively picked up a large shard of glass and without thinking performed the crosswise and vertical slits of a ritual suicide freeing her from her status as a Zombie. He then aimed his shotgun and pulled the trigger, but not before Helen DaSilva intervened with her telekinesis and flipped the barrel causing him to blow his own head off. The game ended at this point with Pete surviving, Elinore and Helen remaining as wraiths, Mel transcending and Ko potentially transcending if Iko and unnamed husband had no further business. This game was fantastic fun and I have glossed over a lot, including a lot of the comedic banter all the way through. We played a very stripped down fast and loose interpretation of the rules which was fine as we, the players, were more interested in the story. It was a non standard version of Wraith, given it didn’t delve into the world or politics of Wraith but that didn’t detract from the experience. Wraith: The Oblivion 20th Anniversary Edition should be out soon and I am absolutely looking forward to getting that particular book. It was also interesting from the perspective of an ST. The rules were stripped bare and it worked. I could have dropped any plot and it could have worked. I spoke to Matthew afterwards about how he copes with such games and he told me that you just run with what the players introduce. We had a break halfway through and he was able to use that time to make any notes to realign the ending, but realistically we could have fought the Neverborn anywhere, and we could have found the captive wraiths anywhere. In many respects that reduced the difficulty of running the game to simply creating a monster and having a location where stuff could happen. But keep that location, in our case the hunting lodge, fluid so players can drive it. It seemed to work really well. I hope you enjoyed my account of my adventures as a zombie. Until next time.